High-quality prairie grass for a variety of uses. Wide assortment of beautiful prairie wild flowers for the backyard field. 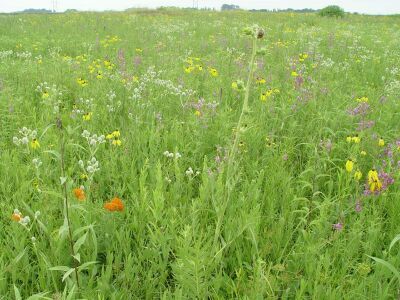 Minnesota CRP Mixes are specifically designed to meet the Minnesota Conservation Reserve Program standards. Each state has standards specific to their own state. It is important to purchase seed mixes that satisfy your specific seeding plan. If in doubt on what to purchase or you have questions, don't hesitate to call one of our seed consultants for a free consulation. A broad-spectrum prairie grass and wildflower mix for sites with full sun and medium to dry soils. Our mix contains short to tall grasses accenting the wildflowers and also fighting off the weeds giving you a beautiful prairie. This mix provides habitat for rare and declining wildlife species by restoring, conserving and increasing the diversity of native plant communities. The more grasses and forbs (wildflowers) the more diverse mix you have to attract wildlife. These mixes provide a food source for the baby chicks and adults by drawing insects into the wildflowers. The first 6 weeks of a baby chick’s diet consists of only insects. This contains some of the most beautiful and beneficial wildflowers not to mention this also provides habitat for rare and declining wildlife species by restoring, conserving and increasing the diversity of native plant communities. The more grasses and forbs (wildflowers) the more diverse mix you have to attract wildlife. There are tall mixes and short mixes. Tall mixes are going to provide cover for Pheasant, Turkey and Deer where your short mixes will provide cover for Pheasant, Quail and Prairie Chickens. These mixes provide a food source for the baby chicks by drawing insects into the wildflowers and also feeding adult birds and other wildlife.